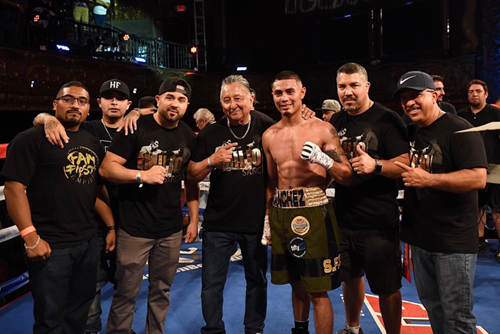 Featherweight Emilio Sanchez (16-1, 11 KO’s) took on a crafty Christopher Martin (30-11-3, 10 KO’s) in the main event of The Golden Boy Promoted card from Downtown Los Angles. Sanchez came in as the young hard hitting up and comer while Martin took his usual role as gate keeper and spoiler. 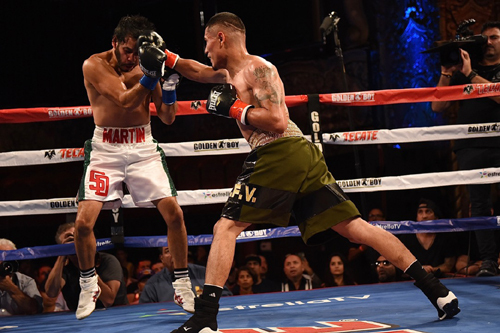 Throughout the fight Sanchez was throwing punches from all directions but a slick Martin was able to dodge and parry a good portion of the errant blows. The combination of Sanchez volume punching and Martin’s bobbing and weaving made for some fan friendly moments. Along the way Martin did taste the canvas thanks to a well placed right hand. As the fight ensued uppercuts became the order and Martin tasted a mouthful. By round 5 an angry mouse developed on Martins right eye due to the constant barrage of punches. 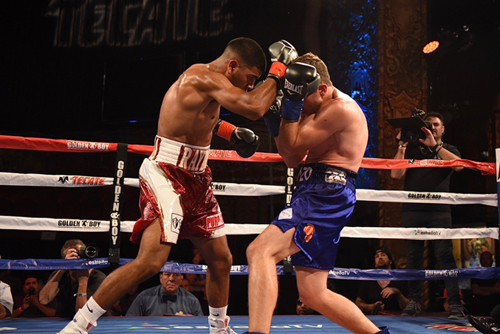 That would become his undoing as the ref had no choice but to stop the fight after the fifth round. 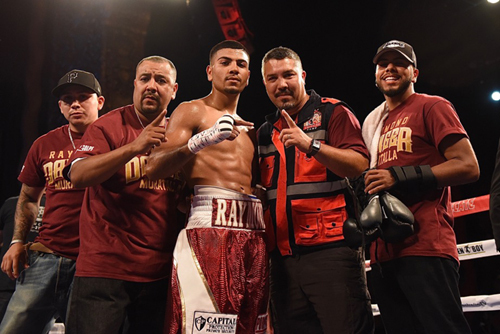 Lightweights Hector Tanajara (15-0, 5 KO’s) and Emmanuel Morales (7-3, 4 KO’s) battled over eight rounds in a one sided affair that went the way of Tanajara when final scores of 80-72 were handed out by all three judges. 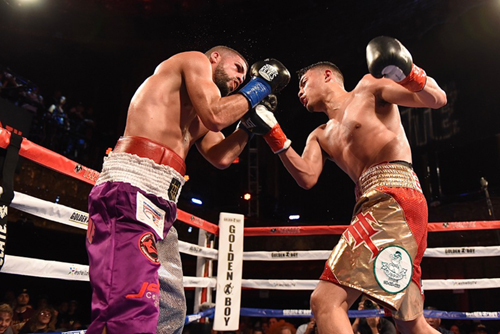 This bout was never in question from the first round on as Tanajara displayed great ring generalship throughout the fight. 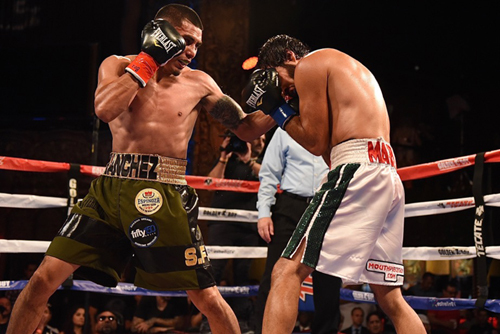 Morales proved to be a tough warrior as he hung in there to the bitter end. 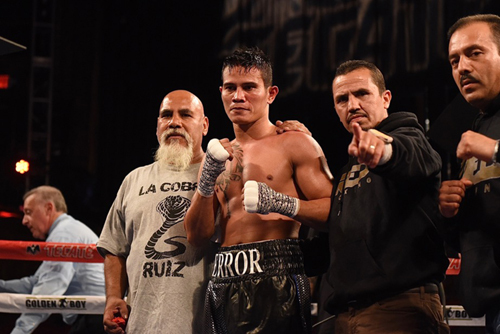 Super lightweight Raymond Muratalla (5-0, 3 KO’s) dropped Guillaume Lorenzo (2-2) in round three on his way to an impressive unanimous decision over four rounds. The French fighter Lorenzo was a game fighter who proved to give Muratalla some good work in this one. 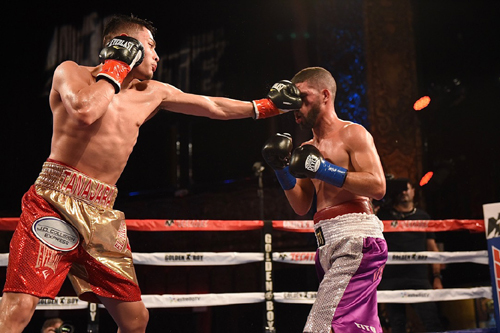 But Muratalla showed some real promise in the victory with his hand speed and punching power. Judges were all in agreement in the scores that read 40-35. 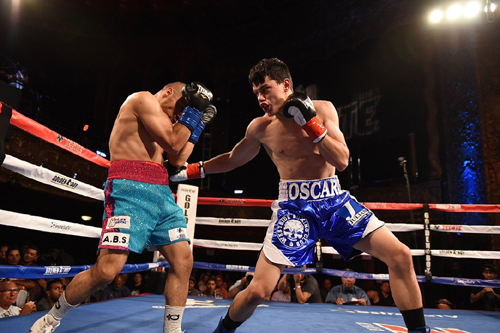 Super featherweight Oscar Acevedo (4-0) defeated Gerardo Molina (2-5, 1 KO) by unanimous decision in an entertaining 4 round battle. For Acevedo the victory may not taste as sweet as it should. 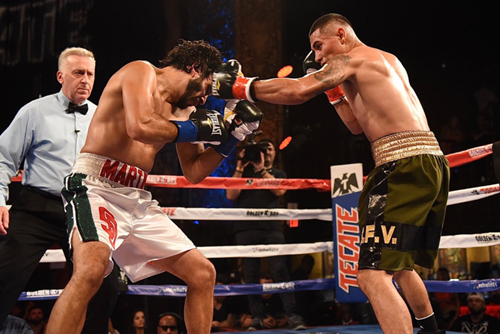 Coming into the fight Molina had been KO’d in all his losses but was able to stay on his feet to the end of this bout. For Molina it’s a bit of a moral victory. 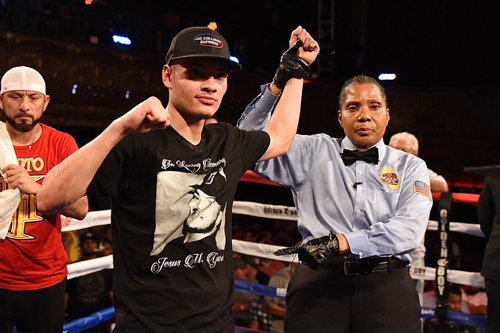 For Acevedo the 40-36 scores across the board put another notch on his belt but questions about his punching power loom. 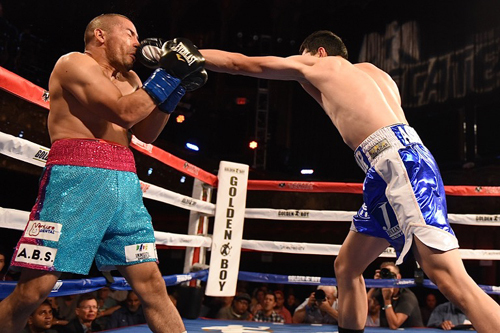 Lightweight Recky Dulay (11-4, 10 KO’s) chopped away at Juan Sandoval (7-23-1, 4 KO’s) over the first four rounds and then let a right handed axe drop Sandoval at the 35 second mark of round five. TIMBER!! Dulay dropped Sandoval like a chopped down redwood whose slow decent to the canvas spelled his demise after a respectful performance.